"Akronlife's annual "Best of the City" awards were announced in the July issue of akronlife magazine. Hudson's Restaurant, a locally owned and operated restaurant, swept the Food & Drink category with eight honors." "Hudson's Restaurant will feature its new Spring Menu available March 21-June 20. Hudson's Spring Menu highlights Mother Nature's bounty of spring produce in the Shrimp Cobb Salad with shrimp, avocado, bacon, gorgonzola cheese, tomatoes dressed with lemon rosemary vinaigrette." "Hudson's Restaurant is featured in Taste of Main Street America (JEC Publishing Co., $14.99). The cookbook features local, independent restaurants throughout the United States located on Main Street." "Hudson's Restaurant presents the 2011 Lenten menu beginning Ash Wednesday, March 9, and served every Friday throughout the Lenten season." "Hudson's Restaurant & Catering, known for their passion for fresh ingredients and authentic flavorful cooking is announcing special menu items prepared in celebration of St. Patrick's Day." "Continuing their tradition of giving back to the community, Hudson's Restaurant announced today a donation of $350 to Triple Negative Breast Cancer Foundation." "Hudson's Restaurant on the Green was honored with the title of Hudson's Best Chili for the second year running on Saturday, September 19th at the second annual Hudson 5K / Chili Challenge event. Topping the field of several local restaurant entrants, Hudson's was the "People's Choice" winner with their traditional red chili and white smoked pork chili." "An Akron restaurant chef's tiramisu - made with two kinds of Girl Scout cookies - wowed judges at the 18th Dessert First Gala, a Girl Scouts fundraiser." "Holding a piece of flatbread pizza in one hand and a paint brush in the other, Patti Kurtz leaned in, careful to get each stroke just right. After all, her 90-year-old mother is an artist and she wanted to do her proud." "Maybe my favorite thing about Dave's "On and Off the Beaten Path" is when he writes about a place that can't be described in exotic terms, no culinary magic outside a well executed plate, no off the beaten path craft brews or bourbons to write about..."
"Owner/Chef of Hudson's Restaurant Kevin Altomare creates the Ultimate Chicken Sandwich!" "The last time I ran into Chef Kevin Altomare was at the Hudson's Farmers Market back in late September. I was giving a demonstration on how to make panzanella salad and he happened to be sitting near the demonstration tent and we struck up a conversation." "We are joined in the kitchen with JJ's Father, John who is preparing Tuscan Flatbread and he also prepares their loaded house chips"
"A special thank you to the owner's of Hudson's Restaurant for providing today's recipes!" 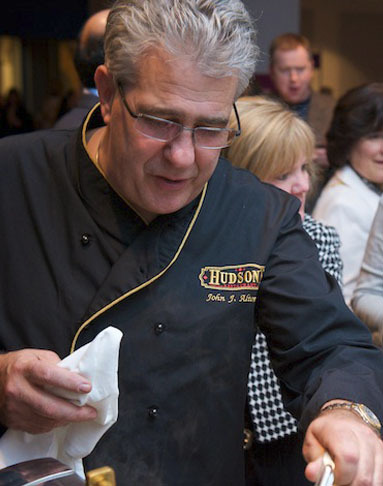 "Owner and Chef of Hudson's Restaurant on the Green John Altomare cooks up a delicious bourbon style tilapia." Casual dining at its Finest. Fresh, chef prepared food in a warm, and inviting atmosphere. We offer a wide variety of specialty martinis complements our full service bar.